Tampa, FL -December 8, 2007- “The Newport Nightmare” Jimmy Owens (Newport, TN) was the beneficiary of bad luck that struck two different race leaders on his way to winning the $10,000 to win StormPay.com Dirt Late Model Series Crate Racin' USA World Championship at East Bay Raceway Park, Saturday night. It was Owen's second win of this event since its inauguration back in 2005. Stacey Roberts (Sylvester, GA) took the early lead, from his outside pole starting position relinquishing the spot to Randy Korte (Highland, IL), the defending race champion, on lap twelve of the 100 lap grind. Korte looked like he had everyone covered as he was able to pull away from the rest of the field, at will, despite numerous cautions. Lady Luck frowned on Korte as something broke in the front suspension coming down the front straightaway on lap 85 vaulting him into the wall just beyond the flagstand. He was unhurt by the impact. This gave the lead back to Roberts followed by Owens, Doug Horton (Bruceton Mills, WV), Randy Weaver (Crossville, TN) and Frankie Beard (Hartwell, GA) who made up the top five for the restart of the race. Roberts enjoyed his run at the front for only three laps when the driveshaft broke on his car as he exited turn two on lap 89 shattering his dreams of winning. Owens inherited the lead and held on to the checkers followed by Horton, Weaver (Disqualified in post race inspection), Beard and Todd Morrow (Old Fort, TN). Shannon Buckingham (Morristown, TN), Anthony White (Clinton, TN), Derrick Rainey (Powder Springs, GA), Kenny Schrader, (Fenton, MO) and Steve Mathis (Plant City, FL) rounded out the top 10. Owens set fast time in Friday night qualifying besting 73 other entrants with a lap around the 1/3 mile clay oval in 15.922 seconds. His efforts earned him the pole starting position in the first qualifying heat. Owens lead that heat from wire-to-wire assuring himself of another pole shot this time in the 100 lap A-Main feature. David Gentry (Lewisburg, TN), the 2006 and 2007 StormPay.com Dirt Late Model Series National Champion, was disqualified from his fifth heat race win on Friday night. Gentry swapped out engines on Saturday morning and Storm Pay.com DLMS officials tore down the engine used Friday night only to find unapproved valves in the engine. 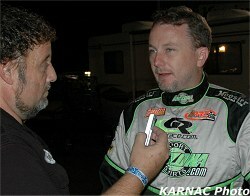 Gentry was immediately disqualified from the StormPay.com Dirt Late Model Series World Championship race. The Crate Racin’ USA World Championship Race was the final event run under the StormPay.com banner as the series returns in 2008 with a new sponsor NeSmith Chevrolet. The first event for the NeSmith Chevrolet Dirt Late Model Series will be on January 5-6 at Talladega Short Track in Eastaboga, AL. 1ST HEAT: 1. Owens; 2. Johnny Pursley; 3. K.Nosbisch; 4. S. Rogers; 5. J. Nosbisch; 6. Johnson; 7. Conyers; 8. Godsey; 9. Flowers; 10. Murphy; 11. S. Miller; 12. M. Miller. 2ND HEAT: 1. Roberts; 2. Lyons; 3. Buckingham; 4. Franklin; 5. Dohm; 6. Cloer; 7. Nipper; 8. O'Connor; 9. Gillman; 10. Crouse; 11. Hill; 12. Blair DNS. 3RD HEAT: 1. John Pursley; 2. Beard; 3. Rainey; 4. Schmauss; 5. Sharpe; 6. Cline; 7. Nye; 8. Varnadore; 9. R. Thomas; 10. Turner; 11. Fortner; 12. Austin. 4TH HEAT: 1. Korte; 2. Mi. Collins; 3. Mathis; 4. Babb; 5. Maddox; 6. J. Peacock; 7. White; 8. Knowles; 9. Erskine; 10. S. Smith; 11. Santel; 12. Harris. 5TH HEAT: 1. Gentry; 2. Horton; 3. J. Smith; 4. Cobb; 5. Schrader; 6. Tays; 7. W. Peacock; 8. Mo. Collins; 9. Sanders; 10. Wilds; 11. Matthews; 12. B. Smith; 13. Williams. 6TH HEAT: 1. Weaver; 2. Morrow; 3. Fields; 4. W. Thomas; 5. Faircloth; 6. Kreke; 7. Brindle; 8. R. Rogers; 9. Freeman; 10. Mitchell; 11. Ingram; 12. Strickland; 13. Hall.